Increased demand drives double digit quarterly sales growth. Additional growth limited by available strain mix in quarter. Strong product availability subsequent to quarter end enabled major milestone of first million dollar sales day. SMITHS FALLS, ON, Feb. 14, 2017 /CNW/ – Canopy Growth Corporation (TSX: WEED) (OTC: TWMJF) (“Canopy Growth” or “the Company”) today released its financial results for the third quarter of fiscal year 2017, the period ended December 31, 2016. All financial information in this press release is reported in Canadian dollars, unless otherwise indicated. Consolidated financial results include the accounts of the Company and its wholly‑owned subsidiaries which include Tweed Inc. (“Tweed”), Tweed Farms Inc. (“Tweed Farms”), and Bedrocan Canada Inc. (“Bedrocan Canada”) and its investments in affiliates. The Company had over 29,000 registered patients at December 31, 2016 compared to over 8,000 at December 31, 2015, representing a greater than 260% increase. Inventory at December 31, 2016 valued at $50.6 million comprised of 8,375 kilograms of dry cannabis and 2,683 litres of cannabis oils, providing a strong base for growing demand and continue growth. Of the total dry cannabis on hand, less than 10% was available for sale during and at the end of the quarter to address the demand for THC/CBD varieties and price points. The recent release of our first wave of new genetics and Tweed Farms product resulted in one million dollars of store sales in a single day, on February 1. 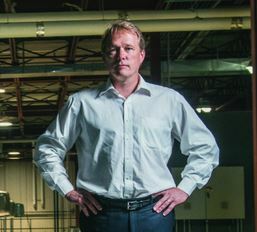 That is a major milestone for Canopy. Two years ago, we had our first million dollar quarter, a year ago we had our first million dollar month, and now we have had our first million dollar day. It’s definitely trending well. Revenue for the third quarter fiscal 2017 was $9.8 million, a 15% increase over the second quarter fiscal 2017 in which revenue was $8.5 million and an increase of 180% over the prior year period in which revenue was $3.5 million. Revenue year-to-date in fiscal 2017 totaled $25.2 million, an increase of 230% over the prior year period when revenue was $7.7 million. During the third quarter fiscal 2017, Canopy Growth sold 1,245 kilograms and kilogram equivalents at an average price of $7.36 per gram, up from 462 kilograms at an average price of $7.34 per gram during the prior year period. Year‑to‑date, the Company has sold 3,399 kilograms and kilogram equivalents at an average price of $7.12 per gram compared to 996 kilograms at an average price of $7.49 per gram in same period last year. The recovery to cost of sales during the quarter ended December 31, 2016 was comprised of a non-cash unrealized gain on changes in the fair value of biological assets of $18.1 million which was partially offset by inventory expensed of $9.5 million and $1.4 million for other production costs, for a net recovery to cost of sales of $7.2 million. The recovery to cost of sales during the nine month period ended December 31, 2016 was comprised of a non-cash unrealized gain on changes in the fair value of biological assets of $40.9 million, which was partially offset by the inventory expensed of $24.6 million and other production costs of $5.3 million for a net recovery to cost of sales of $11.0 million. Gross margin for the third quarter fiscal 2017 was $16.9 million, or 174% of revenue compared to $2.8 million or 79% of revenue in the comparison period. Gross margin over year-to-date in fiscal 2017 was $36.2 million or 144% of revenue compared to $16.3 million or 213% of revenue in same period last year. Gross margin includes the unrealized gains on changes in fair value of biological assets. The Company’s “Adjusted Product Contribution”1 is a Non-GAAP metric used by management which adjusts the reported gross margin by excluding the fair value measurements as required by IFRS and measures the cost of sales for the grams actually sold in the period. Management believes this measure provides useful information as it reflects the gross margin based on the Company’s weighted average cost per gram from seed to sale against the grams sold. The Adjusted Product Contribution in the third quarter of fiscal 2017 was $6.7 million, or 68% of revenue compared to $2.4 million, or 70% of revenue in the comparison period last year. Year‑to‑date, the Adjusted Product Contribution was $16.3 million, or 65% of revenue compared to $5.0 million or 65% of revenue in the prior year period. Sales and marketing expenses in the third quarter fiscal 2017 were $3.8 million, or 39% of revenue, including non-cash share-based compensation of $0.6 million related to previously issued escrowed shares. In comparison, sales and marketing expenses were $1.4 million or 39% of revenue in the same period last year. Year-to-date, the sales and marketing expenses were $8.9 million or 35% of revenue compared to sales and marketing expenses of $3.3 million or 43% of revenue in the prior year period. Year-to-date sales and marketing expenses in fiscal 2017 include non-cash, share‑based compensation of $1.0 million related to previously issued escrowed shares and $1.3 million in higher patient support payments directly attributed to patient growth. Also included are higher staff levels, costs associated with the Company’s medical outreach program, branding programs and the expanding client care center. General and Administrative (“G&A”) expenses in the third quarter fiscal 2017 and 2016 were $4.0 million and $2.0 million, respectively. G&A expenses, as a percentage of revenue, continued a downward trend, decreasing from 56% in the third quarter fiscal 2016 to 42% of revenue in the third quarter fiscal 2017. Year-to-date, G&A expenses in were $10.9 million or 43% or revenue. In comparison, G&A expenses were $5.6 million or 73% of revenue, in the same period last year. The increase in G&A expenses over the nine months ended December 31, 2016 reflects the Company’s growth and building of commercial capacity and capability. These costs include a full nine months of Bedrocan operations, amounting to an increase of $1.5 million over the prior year period, fees related to the Company’s graduation to the TSX in the amount of $0.4 million, higher audit and professional services fees of $0.3 million, and higher finance charges such as credit card payment processing fees of $0.3 million due to increased sales activity. G&A expenses during the nine-months ended December 31, 2016 also included higher employee compensation related expenses due to increased staff levels, one-time employee compensation related expenses, and extensive use of consultants, legal and advisory services in merger and acquisition activities and in expanding and commercializing the Company’s operations and facility costs at Tweed, Tweed Farms and Bedrocan. In addition, compliance costs associated with meeting Health Canada requirements, as well as other public company related expenses including related professional fees were included. Net income in the third quarter fiscal 2017 was $3.0 million or $0.03 per basic share and $0.02 per diluted share compared to a net loss of $3.3 million or $0.04 per basic and diluted share in the comparative period last year. Year-to-date, the Company recorded net income of $4.5 million or $0.04 per basic and diluted share, compared to net income of $1.6 million or $0.02 per basic and diluted share. The Company’s “Adjusted EBITDA”2 is a Non-GAAP metric used by management which is Income (loss) from operations, as reported, before interest, tax, and adjusted for removing other non-cash items, including the stock based compensation expense, depreciation, and the non-cash effects of accounting for biological assets and inventories, and further adjusted to remove acquisition related costs. Management believes Adjusted EBITDA is a useful financial metric to assess its operating performance on a cash basis before the impact of non-cash items and acquisition activities. Adjusted EBITDA in the third quarter fiscal 2017 amounted to a loss of $4.6 million compared to a loss of $3.6 million in the same period last year. In the nine-months ended December 31, 2016, the Company’s Adjusted EBITDA amounted to a loss of $11.7 million. In the nine-months ended December 31, 2015, the Company’s Adjusted EBITDA amounted to a loss of $9.7 million. At December 31, 2016, the Company’s cash, comprised of cash and cash equivalents totaled $92.5 million, representing an increase of $77.1 million from March 31, 2016, principally due to the equity raised through to December 31, 2016. Inventory at December 31, 2016 amounted to $50.6 million (March 31, 2016 – $22.2 million) and biological assets amounted to $5.3 million (March 31, 2016 – $5.3 million), together totaling $55.9 million (March 31, 2016 – $27.5 million). At December 31, 2016, the Company held 8,375 kilograms of dry cannabis and 2,683 L of cannabis oils. Included in the dry cannabis quantities was 711 kilograms available for sale in the Company’s on-line stores, 3,809 kilograms in process of finishing or awaiting approval for sale and 3,855 kilograms held for extraction. Dry cannabis inventory held for extraction is expected to be rapidly converted to oils and capsules when the new AES industrial capacity extraction equipment is fully commissioned and capsules are approved for sale by Health Canada. The Unaudited Condensed Interim Consolidated Financial Statements and Management’s Discussion and Analysis documents for the three and nine months ended December 31, 2016 have been filed with SEDAR and are available on www.sedar.com. The basis of financial reporting in the Unaudited Condensed Interim Consolidated Financial Statements and Management’s Discussion and Analysis documents is in thousands of Canadian dollars, unless otherwise indicated. Note 1: The Adjusted Product Contribution is a non-GAAP financial measure that does not have any standardized meaning prescribed by IFRS and may not be comparable to similar measures presented by other companies. The Adjusted Product Contribution is reconciled and explained in Management’s Discussion & Analysis under “Adjusted Product Contribution (Non-GAAP Measure)”, a copy of which has been filed today on www.sedar.com. Note 2: The Adjusted EBITDA is a non-GAAP financial measure that does not have any standardized meaning prescribed by IFRS and may not be comparable to similar measures presented by other companies. 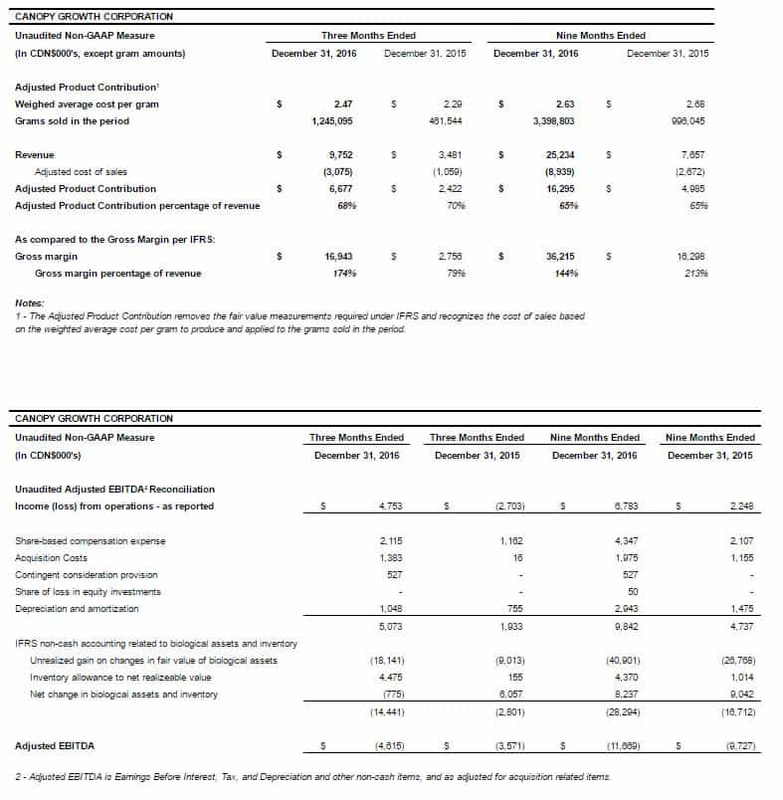 The Adjusted EBITDA is reconciled and explained in Management’s Discussion & Analysis under “Adjusted EBITDA (Non-GAAP Measure)”, a copy of which has been filed today on www.sedar.com. A replay of the call will be accessible by telephone until 11:59 PM ET on March 14, 2017.